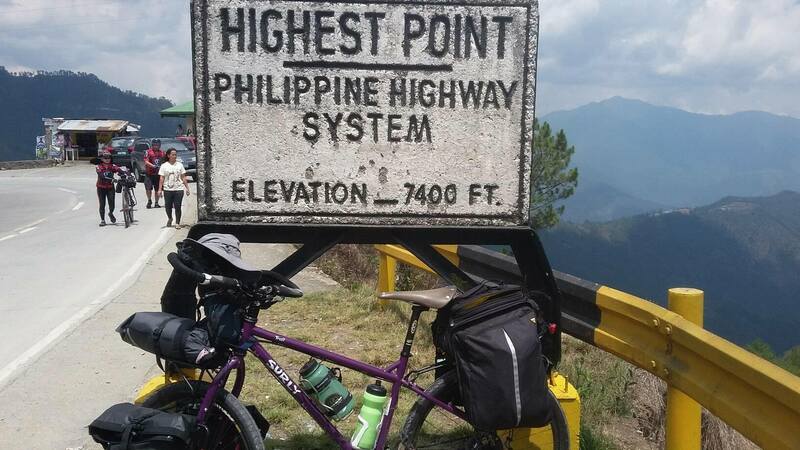 In the Philippines, Baguio is considered as one of the foremost destinations if one decides to do serious cycle touring. Located north of Luzon, it is the one of the places that offers stunning views amidst challenging terrain and weather conditions. So, with two friends Edan and Prixie, we took off early morning and we’re lucky to be accompanied by Dennis of Bulacan. For day 1, our trip was fairly straightforward- riding through 180 plus km of flat road. Good thing cycling to the Pozzorubio, Pangasinan was less miserable as the weather was cool even in the afternoon. Day 2 was a challenge as we had to get to Baguio via Kennon road which was a narrow road varying grades of climbs in addition to the many vehicles passing by. The trip was quite fine-though we had difficulty looking for accommodation on the second day as many people were in Baguio during the holiday season. I used a wald 137-a medium sized basket attached to a surly 8 pack rack using zipties. For storage, two drybags for clothes and items for the trip. Given the generous space of a basket for goods and stuff, I found this as a big plus as I don’t need to remove all the bags whenever I need specific items. Easy access even while pedaling is an advantage when you’re riding using a basket. Given that all the stuff is just in one place, securing the load is fairly easy (I used a bungee cord for my bags). No need for attaching different bags on parts of your bike. In terms of durability using a basket works best when it is attached to a front rack. During the trip, the basket didn’t move or sway even on bumpy roads. However, there are two issues when using baskets. First, though I have experience in riding with light to heavy loads, steering with a basket can sometimes get twitchy. And second, basket commuting can pose issues in tight spaces during heavy traffic. So far,I don’t find these bothersome in the overall quality of the ride.